Derivative instruments are the contracts used in the global market for future commodities. The value of these contracts exceeds two trillion U.S. dollars per day, making them the world's biggest market. Very little of substance has been published about this critically important business and its implications for the future direction of the world economy. This work is a collection of papers presented at the International Conference on Derivative Instruments at London University's Institute of Advanced Legal Studies in October 1993. It contains the current views of the world's leading regulators, most successful traders and top legal, economic and scientific experts in this rapidly growing market. The size and continued growth of this sector of the financial services business means that an increasing number of lawyers, government and market regulators, and people active in the financial services industry need to have a solid understanding of trading in derivative instruments. 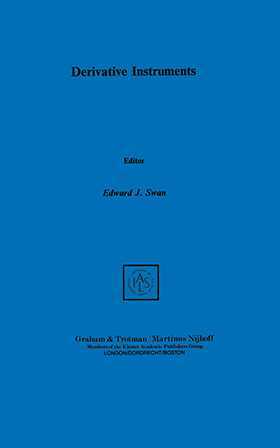 This volume contains the explanations of the most knowledgeable experts and is an ideal primary source for newcomers to begin to learn about derivative instruments and for experienced practitioners to expand their understanding.